The Cal women swim team led each of the three days at the NCAA tournament and captured the national championship crown on Saturday. 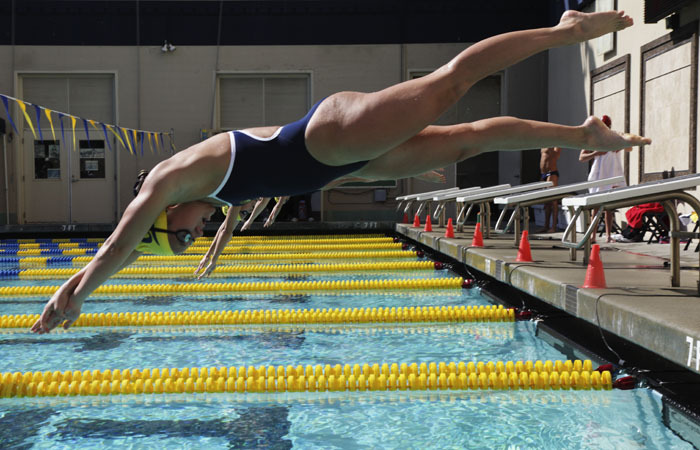 Before 2009, the Cal women’s swimming team had never won a national championship. Four years later, the Bears find themselves holding three of the past four trophies. Cal won its second national championship in a row at the James E. Martin Aquatics Complex on Saturday. After three days of competition in Auburn, Ala., the team finished with 412.5 points, easily eclipsing second-place Georgia (366 points), third place USC (325.5) and Arizona (318). The victory was sweetened when head coach Teri McKeever and junior Caitlin Leverenz won Coach of the Meet and Swimmer of the Meet, respectively. Leverenz, who has been one of the top swimmers in the country this year, nabbed four first-place finishes, winning the 200 breaststroke on the final day, setting school and pool records. She set an American record in the 200 individual medley and also helped the Bears claim the 400 and 200 medleys. Despite Leverenz’s wild success, there were major contributions from her teammates that allowed the Bears to claim the win. In the few moments in the meet that the Bears seemed to be slipping or giving back their lead, nearly all of the swimmers came through. Sophomore Cindy Tran came out hot on day two, winning the 100 backstroke for the second year in a row. Liv Jensen, a senior in her last meet for Cal, placed fifth in the 100 free, keeping the Bears afloat with a slim, 16-point lead on the final day over the rapidly approaching Bulldogs. Perhaps the most telling victory, though, came from somewhere unexpected. Kahley Rowell, the first Cal diver to qualify for the NCAA Championships in 20 years, came up with the clinching win for the Bears. With her fifth-place finish on the platform, the Bears led by more than 50 points over Georgia with only one race to go, making it mathematically impossible for the Bulldogs to come back. The Bears’ performance stands in stark contrast to the way their regular season ended. After a blowout 174-126 loss to Stanford, the worst since 2009, the Bears looked weak and the road ahead seemed increasingly difficult. Cunnane believes that much of the credit for this win should be directed to seniors such as Jensen, Shelley Harper, and Sara Isakovic, all of whom helped the team get off to a strong start. The eight seniors will retire from their collegiate careers having won three national championships. In a previous version of this article, Kahley Rowell’s name was misspelled.